Reprint. Originally published: London: Allen Lane, 2017. 'Most contemporaries would have argued that it was a king's job to put in peril his soul for the good of his Church and of his people. But Henry was too determined to live a life of a saint'Henry III, the son of King John, was catapulted onto the throne aged just nine and reigned for fifty-six years, during which time his self-conscious piety often put him at odds with those around him. 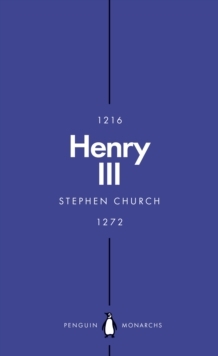 Yet as this sparkling account makes clear, he deserves to be better known: for the birth of Parliament, the building of Westminster Abbey, and the development of a kingdom that still recognizably exists today.